Hannah just recently got back from a family vacation in Maui, and seeing as our company does vacation renal management, I had to ask her to give us a Maui travel guide :) She spent a week on the island relaxing and snorkeling through the reefs with the green sea turtles. Living the island life style one Mai Tai at a time. Longhi's - Beautiful Italian restaurant in Lahaina. Monkeypod Kitchen - Newest restaurant in Whaler's Village. Great bar, great ambiance, amazing food, and live music. Hula Grill - Home of the Hula Pie!! Must go for this delicious dessert. Dukes - Located at the Hanua Kai Resort and they give you to go drinks so you can go lay out by the pool. Merriman's Kapalua - 5 star restaurant with the most beautiful sunset in Hawaii. Down the Hatch - Cool Hangout bar with their own shaved ice bar. They have Happy Hour everyday as well as live music. Choice Health Bar - Best acai bowls and they are so big!! Mama's Fish House - located near the airport. Definitely stop by here for some good seafood. Kaanapoli Beach: located right in front of most of the Hawaiian resorts and spas. All along this beach they have every activity you could think off. Parasailing: ride tandem or a triple and be lifted 1200ft into the air. Snorkeling: rent gear for the day for a reasonable price. Front Street Lahaina: walkable downtown area with a lot of shops, fun restaurants, and live music everywhere you look. 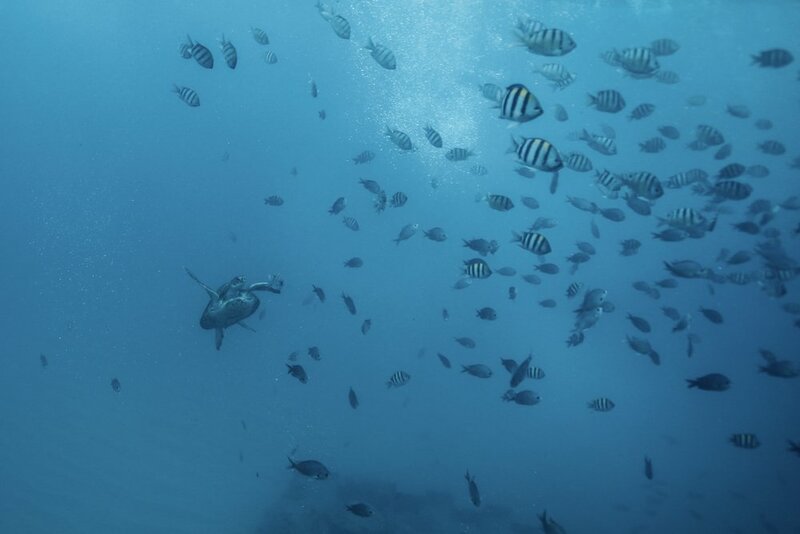 Snorkeling at Molokini: there are many snorkeling companies out there that will take you to one of the best snorkel spots in maui. This crater shaped island is home to so many fish. The company we went through is Pacific Whales organization and their profits contributes to ocean research and development. Haleakala Sunrise Bike Tour: Get up at 3am to see the sunrise from 10,000 ft above. After that you get to bike down the volcano and get a tour of the Hawaiian country side. Bring reef safe sunscreen: There are a ton of reefs in Hawaii and we have to remember that this is home to many fish out there and the sunscreen that most of us use has very harmful chemicals that contribute to the decline of healthy reefs. Raw Elements is a sunscreen that is safe for reefs. Rent a car: the island is very car friendly and having a car will allow yourself not to be limited by Uber. Fairly inexpensive as well. Airport shuttle service: if you are not going to rent a car there are round trip shuttle services to and from the airport.